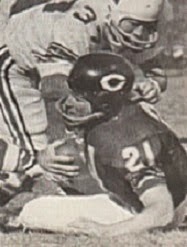 On August 23, 1964 the Chicago Bears picked up HB Jon Arnett from the Los Angeles Rams in exchange for G Roger Davis, a five-year veteran; C Joe Wendryhoski, a first-year NFL player from Illinois who had been All-Big 10 and had seen action in the CFL; and rookie DB Frank Budka from Notre Dame, who had been a college quarterback. The 29-year-old Arnett was 5’11” and 195 pounds and had been LA’s first draft choice out of USC in 1957, the second pick overall and ahead of FB Jim Brown, who the Browns took four picks later. A former gymnast as well as hurdler, he was highly regarded in college for his speed, balance, and running instincts and made an immediate impression by leading the NFL in kickoff returns as a rookie. “Jaguar Jon” also saw action at halfback and rushed for 347 yards while gaining another 322 yards as a pass receiver who averaged 17.9 yards on his 18 catches. He was named to the Pro Bowl for the first of five consecutive seasons. Arnett was a consensus first-team All-NFL selection in 1958 as he moved into the starting lineup and gained 1177 yards from scrimmage (683 on 133 rushing attempts, 494 on 35 pass receptions). He led the league in punt return average (12.4) and continued to return kickoffs. His greatest single-game performance came at home against the Bears as he accumulated 295 total yards, although he failed to score a touchdown. His 1731 all-purpose yards ranked second in the NFL, just eight behind Jim Brown. The ’58 season proved to be his most productive – it was also the last time the Rams would finish with a winning record while he was with them. Arnett was used more as a spot player, splitting out to flanker as well as lining up at halfback, but he continued to receive Pro Bowl recognition for his all-purpose contributions that included some spectacular plays, such as a 105-yard kickoff return in 1961. Injuries became a factor and he was bothered by a bad knee in 1963 and, prior to the trade, had seen little action during the ’64 preseason. The Bears, defending league champions, were in need of a halfback following the death of seven-year veteran Willie Galimore in a car accident during training camp. They also had HB Ronnie Bull on the roster, the league’s top rookie in 1962, who was versatile but lacked speed. Arnett split time with Bull at halfback and led the team in rushing with 400 yards on 119 carries for a mediocre 3.4-yard average. Overall, the Bears had the NFL’s least-productive ground game in ’64 as the team dropped all the way to sixth place in the Western Conference. While still an effective runner at times, Arnett no longer had the speed that had made him a star with the Rams. The arrival of rookie HB Gale Sayers from Kansas in 1965 relegated Arnett to a backup role in his last two seasons. He retired after the ’66 season, having gained 10,214 all-purpose yards (3833 rushing, 2290 pass receiving, 981 returning punts, and 3110 running back kickoffs) and scored 39 touchdowns. As for the players that the Rams received for Arnett, Roger Davis was the most experienced, having been taken in the first round of the 1960 NFL draft out of Syracuse, where he had been a star on the 1959 national championship team. He moved into the starting lineup at right guard and spent one year with the Rams before moving on to the New York Giants in 1965. Joe Wendryhoski was with the Rams for three seasons before moving on to the expansion Saints in ’67. Frank Budka was around for just one NFL season, playing as a defensive back and later moving on to the Continental Football League. Moreover, the Rams continued to lose more often than they won in 1964 and ’65, finally turning around under Head Coach George Allen in 1966.